When a man has to go, a man has to go, as the urban saying goes. The same sentiment applies when you’re traveling in your RV. Wastewater tends to build up, and it’s important to regularly dump it and maintain the RV’s “sewage system.” But the question most people ask, and with good reason, is “how to dump RV waste at home?” With this helpful guide, I’ll list the best potential ways of getting rid of RV waste at a low price, and within the comfort of our own homes. I understand that some readers of this text are new to owning an RV, and that’s perfectly fine. Knowing the basics of each RV helps. Therefore, I will note a few key terms everyone ought to know before they dump RV waste. That’s right. 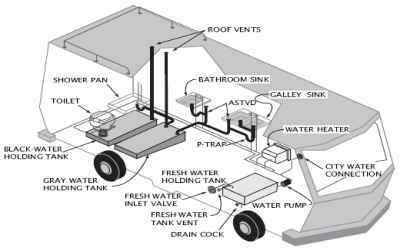 The one thing every RV has to have are (at least) two different types of tanks for two different types of waste. Colloquially, these are known as the black water tank and the gray water tank. Typically, gray water tanks are smaller in size than black ones. The gray tank takes care of “lighter” waste, such as bathroom and kitchen sink water, as well as bathroom water. In short, any water that doesn’t come from the toilet seat. However, there are some RV units that have an additional tank. We call that the galley tank, or the second gray tank. It is used for kitchens alone in certain RV vehicles. Normally, the waste from this tank (or these tanks, depending on the RV) goes down easier, but it still requires maintenance and care. Throughout the text, I will focus more on the black water tank, considering it holds more solid waste. As stated, this tank is linked to the toilet and holds human waste. If the waste isn’t properly disposed of, the black tank can suffer damage quickly, and the repairs are costly (more on that later). Because of what it does, the black tank is usually bigger and bulkier than the gray one. Nearly all RVs have the same drainage system for waste. Usually, we have to remove the cover of the opening located between the tanks. Next, we link the sewer hose onto it. Of the two tanks, the first that we have to empty out is the black one, but even before that, we have to check the valves. Once we start having difficulty pulling a valve out, we better replace it with a new one. It’s important to stress this because if the valves break while the tanks are full, the repairs can cost up to $1000 considering the mess that they’d entail. A single new valve doesn’t cost over $10, and replacing it can be done at home. But how will we know when to empty our tank? Good question. Usually, an RV unit will have four tank sensors that send info to a monitor in the unit. The top three ones register how full the tank is, ranking at 1/3, 2/3 and Full. I cannot stress how important it is to clean these up as well. A dirty, untended sensor can show off false information. And false information can contribute to messing up an RV tank beyond repair. Now that I’ve got the basics out of the way, let’s discuss how to dump RV waste at home. There are several options, and each of them is effective in its own way. There are three major ways of dumping RV waste at home. The first is dumping the waste directly into the toilet via a bucket. All we need is a bucket and a pair of rubber gloves. This particular option works best if small amounts of black tank waste are removed at a time. In other words, we can only fill the bucket up to a certain amount and the flow of the water has to be slow so that nothing spills. After that, the next step is to just take the bucket to the toilet and flush the waste. Probably the biggest issue with this step is the tediousness; it gets really boring really fast. And truth be told, nobody likes the idea of carrying a bucket of waste inside of their home several times during the day. But it is the most cost-effective way of cleaning up and doesn’t require a lot of technical know-how. The second way of dumping RV waste at home is a bit more complicated. For this one, we’ll need to buy a portable macerator pump and attach it to the RV black and gray tank waste outlets. The other end of the pump is for the hose, which can be of any length, though information on recommended lengths usually comes with the pump itself. The pump effectively cuts up any waste into tiny bits, making it easier to pass through the hose. That way, we can actually link the hose to our toilet, or anywhere else, and let the pump do its thing. And I quite literally mean “let it do its thing,” considering that most of these pumps come with automatic shut-off features. The obvious drawback of this step is that it’s rather expensive. Can You Hook up an RV to a Septic Tank? The answer to this is one resounding “yes.” This is the third way of dumping RV waste (after the bucket and the pump). But before I talk about connecting the RV waste system to a septic tank, I ought to give a few fair warnings about doing it. First of all, it’s important to know that not any waste can go into the septic tank. We should try our best not to dump any harmful chemicals. Most of the bacteria that live within the septic tank break down solid matter. By doing so, they make it merge with the soil better. It’s a natural process that fertilizes the land. Naturally, chemicals can kill off these bacteria and pollute the soil further. That’s why one has to be careful before doing this. Next, both the gray and black tanks can be emptied out here. Of course, we should try our best to use eco-friendly cleaning products for this reason alone. Most of the gray tank water will come from bathing or washing dishes, and both of those use chemicals. Should there be too much of these chemicals in the gray tank, we shouldn’t empty it into our septic tank. Each septic tank has an access point, which is usually a somewhat narrow pipe sticking out of the ground. 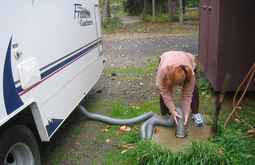 Depending on money or time, we can either connect the RV sewer pipe to the septic access point or connect the said point to the same hose coming from the macerator pump, described a few paragraphs above. Whichever way we choose to do this, we have to make sure the hose stays in place and doesn’t “wander.” Nobody wants a septic sprinkler in their home. After securing the pipes, it’s time to let the waste loose. One key thing to remember is that too much waste added to the septic tank can disturb it in more ways than one. As such, we ought to always empty our black tank when it’s two-thirds full. Anything beyond could cause a mess. It’s also extremely important to get help when removing an access port lid (with septic tanks that don’t have a cleanout). Toxic gasses can spew out from the tank, and they can be lethal. Yes, it is possible to build a personal RV dump station. The first thing we need to know before doing it, however, is not to have a quick drop. With a quick drop, the solid waste will not go with the water. If possible, change the elevation half an inch for every hundred foot line, and make each drop 90 degrees. With that, we can now start building our private RV dump station. The best thing to do is to connect the dump line anywhere between the septic tank and the house right into the septic system. Macerator pumps can also help, but we don’t really need them for this. Naturally, we should aim to connect it directly to the sewer cleanout, but there are people who choose to hook it up right after the septic baffle. 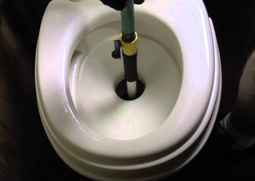 Doing this is the best solution if we want to only occasionally dump the RV waste into the septic system. It’s very important that the waste enters perpendicularly after the baffle, not horizontally. This will direct the solid waste to go down and right into the water level of the tank. When doing this, it’s important to secure the RV septic outlet with concrete. We can do this in a few easy steps. First, take an iron grate and place it atop the outlet. Next, make two 3 ½ inches deep wooden forms and place them around the outlet, making two squares inside one another. Finally, pour the concrete and make a little “fort” around the outlet, with enough room to place the grate on top of it. Why do this, one might ask. Because the grate will protect the outlet if a vehicle passes it, and it’s easy enough to remove in order to empty the tank again when needed. Most times, we might have to empty our tanks at an RV dump station. Of course, this isn’t a bad thing; these stations have the tools necessary to properly remove any RV waste and put it to good use. We can even locate them easily on our iPhone’s map feature. The problem is that they can be miles away from us. From my personal experience, there were times when I had to drive across the state to get to a proper RV dump station. In other words, it cost me both time and money to do it, and I’m not even a frequent RVer like many others. Having an RV septic system in our yards lets us empty both the gray and black tanks easily, without having to drive the RV all the way to a different part of the city. But that’s not the only benefit of having this setup. I’ve met RVers who have successfully converted their RVs into full-fledged sections of their own homes. In order to do that, an RVer really needs a good, stable way of removing waste. As such, building a homemade RV septic system is a plus. In terms of drawbacks, it really depends on what method we’re using to empty the gray and black tanks. 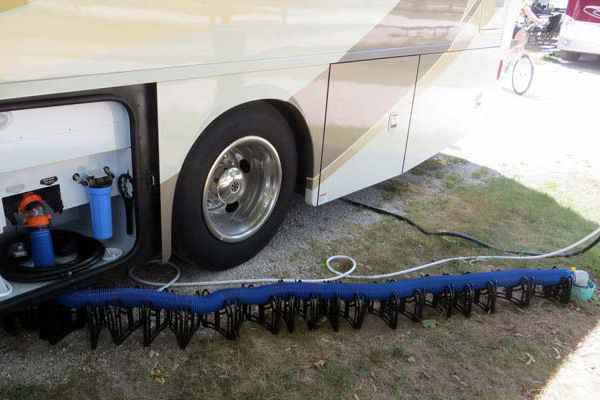 For example, connecting the RV sewer system to the septic system incorrectly can cause major breakdowns and cost the user a lot of money. Maintenance, in general, becomes a bit harder with these setups as well. If, however, we merely use the pump and the garden hose, the real issues lie with one of those two elements not working well. I always recommend a strong hose and a pump with a long warranty. Since these pumps are 12V, plugging them into a normal plug outlet and using them will cause fuses to blow out. It’s best to link them to the RV’s electrical grid. Of course, the drawbacks of dumping waste with a bucket mostly have to do with not handling the bucket well and not hiding the odor properly. Compared to the issues above, they’re not that big of a deal. Knowing how to dump RV waste at home is not only easy, but it also saves money and helps get rid of waste faster. There are, of course, minor drawbacks here and there, but overall, it can work just as well as visiting a local RV dump station. Therefore, I highly recommend trying it to any RVer worth their salt.